Foosball is a game that can make for some great fun, and it always helps to have a camera nearby in case something unbelievable happens. 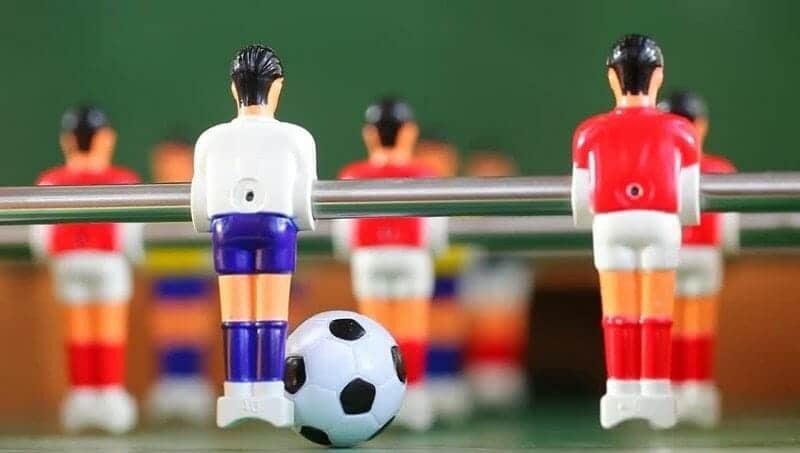 Today, we are going to take a look at some of the most impressive foosball videos that you will find on the web. You’ll find many videos that demonstrate the talents of foosball players online, but we’ll be looking at more than just that. The videos that we will be going over today will involve anything that we consider entertaining. Some of these will be funny foosball videos while others will be videos of the best foosball shots. If one thing’s for sure, you will be entertained. To start things off, we'll take a look at a video that explains the basics of foosball for beginners. Even if you are a veteran of the game, you will find this video invaluable to help introduce the game to newer players. This video goes over everything that you'll need to know about the game. For instance, the video describes some of the things that you will want to avoid doing, like spinning the rods, although there are some exceptions to this rule. The commentator then goes on to show basic foosball technique, such as passing the ball from the defensive line to the mid line to take a shot. It is hard to get an appreciation for just how intense top-level foosball can get until you have seen it. Foosball enthusiasts the world over should see this video to understand how some of the best players in the world play. Through trying to replicate this technique, your skills can only improve. Both Pappas and Collignon have been World Champions at one point or another, and seeing this match is like watching two legends play against each other. The intensity in this matchup is palpable, and the entire six minutes is filled with relentless action that keeps you on the edge of your seat. This is the first of the funny foosball videos that we will be taking a look at, and it surely delivers. It follows a group of YouTubers as they take part in the giant foosball challenge, which consists of what is essentially a game of human foosball. They go through penalty shots, games, and much more. The presenters try out a variety of entertaining full-size foosball games, including handicaps for the goalies at times, which only adds to the fun. If you are looking for a bit of silly entertainment, few of the videos on this list will be able to match the giant foosball challenge in terms of laughs. A slingshot is one of the most challenging trick shots that you can hope to make in foosball, but this video covers how to do one exceptionally well and in an entertaining way. The presenter manages to make the frustrating process of learning how to slingshot entertaining within just over 3:30. While we can’t guarantee that this video will teach you how to slingshot in a day, with enough practice, you will be able to perform one of the most intricate shots in the game. The video demonstrates mostly long slingshots, but the technique can be used for short ones as well. Ball handling is one of the most critical skills that you can have as a foosball player as it provides a foundation for everything else that you will do while playing. The video demonstrates the importance of conserving momentum in the ball and using the kinetic energy in creative ways. This video goes a long way towards showing how much a solid basis of physics can help you in foosball since you will be able to anticipate the path of the ball with greater ease. As you can see from the player in this video, you can accomplish some incredible things with enough practice. This video demonstrates one of the most impressive foosball shots you can make. It consists of passing the ball from balancing on one player to balancing on another and then shooting it into your opponent's goal. While this shot may be illegal and impractical in competitive settings, it is still impressive. This shot essentially catapults the ball into the goal. While the video goes over how to perform the shot, we can't guarantee that you'll be able to learn it without a substantial amount of practice. If you are looking for something that will leave an impression on you, however, this video is certainly one to do so. Unlike the other videos on this list, this one showcases a creation and an impressive one at that. This video shows off a mini foosball table that uses peanut M&M's as balls, and it even dispenses regular M&M's! If you wanted to mix LEGO, snacks, and foosball, there are few better ways. While this video may be more related to LEGO than foosball, it still demonstrates a marked degree of creativity. Though it is a community created LEGO set, it shows just as much effort as an official set, and it even has a chance to become one! The snakeshot is one of the most important skills to possess as a foosball player as it allows you to bypass a steady defense. This is one of the most concise videos that you will find on Youtube that are based on the subject. It is short and sweet, and it tells you everything that you need to know. Keep in mind that you will need to be patient to learn how to perform a snakeshot, so don’t expect to learn it in minutes. As you practice the shot more and more, it will become smoother, like any foosball trick. While this is one of the easier things you can learn, it will still take some work. We hope that these videos have impressed you as much as they have us. The foosball community is very active on Youtube, and you will find countless other videos in the same vein as these. We thank you for taking the time to go over these videos. Feel free to leave a comment down below!